Astronomers put out the call this week for cosmic names worthy of the two unnamed moons of Pluto, and Captain James T. Kirk has answered. Famed actor William Shatner, who portrayed the iconic "Star Trek" starship captain, wants to call them "Vulcan" and "Romulus." 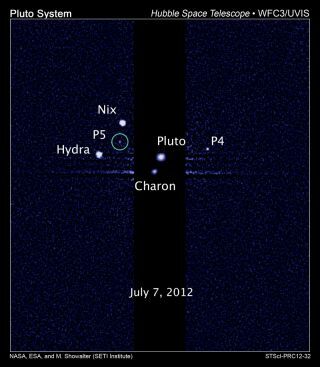 Pluto has five moons but only three of them — Charon, Nix and Hydra — have names. The most recently discovered moons are known by the rather drab names P4 and P5. The two tiny moons are only 15 to 20 miles (20 to 30 kilometers) wide. Pluto and its three named moons are all named for Greek and Roman characters related to the underworld, and scientists are hoping to continue that tradition for the two newest moons. But Shatner thinks the astronomers running the vote at the SETI Instituteoverlooked a couple important possible monikers for the moons. Vulcan is the Roman god of fire and lava and Romulus is a twin brother to Remus in the Roman foundation myth. Astronomers running the Pluto moon naming campaign accepted Vulcan, adding it to the list a day after Shatner suggested it, but Romulus didn't make the cut. "Mr. Shatner's second suggestion, Romulus, has a bit of a problem because it is already the name of a moon," Mark Showalter, an astronomer involved with the competition, wrote in a blog on the Pluto Rocks website on Tuesday. "Romulus, along with his brother Remus, are the names of the moons of the asteroid 87 Silvia. They were discovered by a team led by my good colleague Franck Marchis, now a senior scientist at the SETI Institute." Shatner was still pleased with the results. "Did you hear?" Shatner wrote in a Twitter post on Tuesday (Feb. 12) from his handle @WilliamShatner. "They added the name Vulcan to the list of possible names for Pluto's moons! You did it! I'm so happy." The newly added Vulcan has gained some serious traction in the past couple days, and is currently one of the top three contenders. As of this writing, Vulcan appears to have a slight lead over the second place name Styx, with Cerberus running a close third. So far, more than 215,000 votes have been cast in the moon-naming contest. Pluto's fifth moon, P5, was discovered in 2012 by astronomers using the Hubble Space Telescope. The moon P4 was discovered in 2011. The small moons Nix and Hydra were spotted by the Hubble telescope in 2005. Astronomers first spotted Pluto's largest moon Charon in 1978. SETI's Pluto moon name voting polls will remain open on plutorocks.com until 12 p.m. EST (1700 GMT) on Feb. 25.